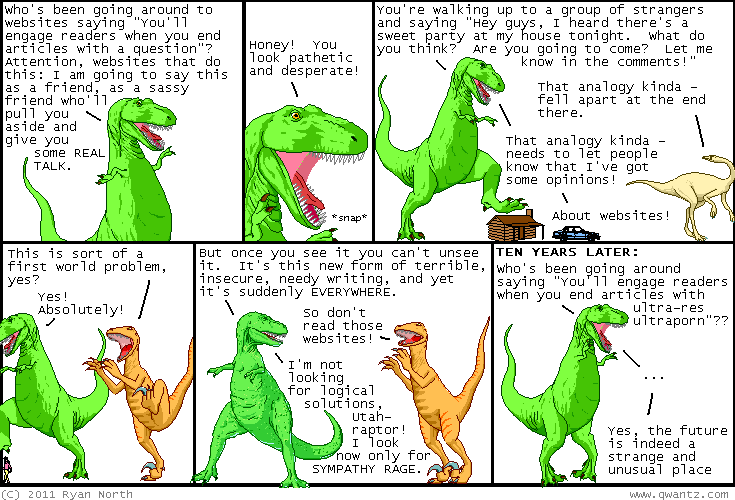 Dinosaur Comics - February 18th, 2011 - awesome fun times! February 18th, 2011: Oh snap, Pixeltime T-Rex is being discontinued and now it's your last chance to get it/him!! From far away it looks like a regular T-Rex picture, and then as you get close it is revealed to be MODERN ART. I love this shirt and wear it out and about; web cartoonists say it's not cool to wear your own shirts but to them I say, take a look at this shirt. Every time I discontinue a shirt I get disappointed emails weeks and even months down the road saying "I want one" and I have to write back sad emails saying "There are none left on the planet; they have all been purchased". You should buy a pixeltime T-Rex shirt for everyone you know, because then there will absolutely be fewer sad emails on the planet! !